Tell us your story… We met at Harrah’s pool party in Atlantic City! I (Ali) was there for a bachelorette party and Jeff was actually there for a bachelor party. I saw him dancing and went right up to him and said “How is it that you’re a red head AND can dance?” He responded by saying “Yeah kid!”, and kept going. Where did you two tie the knot? We had our wedding at the Chateau Briand in Carle Place, Long Island. The outdoor area, where we ended up having our cocktail hour, had palm trees, fountains, and fire pits which reminded us so much of being on a tropical vacation. At that moment, we were sold! Spill the details about your wedding! We kept with the tropical-inspired theme of the outdoor patio and went with cobalt blue, jade green, and white with hints of Bermuda blue for our color palette. The men wore a traditional black tux with bow ties and suspenders. The ladies complemented the groomsmen by wearing either a jade green or cobalt blue dress with Bermuda blue Swarovski jewelry. 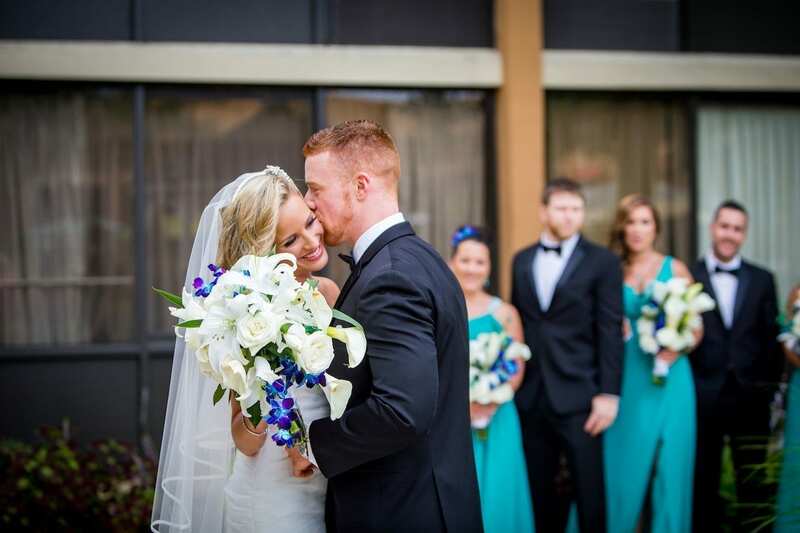 Beautiful flower bouquets and arrangements consisted of white calla lilies and roses with pops of blue orchids. For our music we had a flutist playing Metallica during the ceremony, a live reggae band at cocktail hour, and a DJ/band combo for our reception. It truly felt like a Tropical Wedding! What was your favorite moment? Besides becoming Jeff’s wife, I’d have to say that having everyone you love from all around the world in one room at the same time smiling and enjoying themselves was our favorite part. Nothing will ever top that!